David and Goliath team up for greatness. Recalling the effort that went into my review of the original Von Schweikert VR-4JR, I tried to politely decline the offer to review the Von Schweikert SR-4 Mk2 by suggesting that I didn't really have an amplifier capable of doing justice to the loudspeaker. My mighty Manley Mahis struggled a bit with the bottom end of the JRs and couldn't drive them as loud or as effortlessly as I would have liked. The Plinius had the power, but not the finesse of tubes. The Red Planet Labs home theater amplifier allowed me to bi-amp the JRs best of all, but it went back to the manufacturer. Albert told me the SR had a low of 4 ohms, at which point my Mahis put out only about 18 watts in my preferred setting in triode mode with minimum feedback...and even less than that into 8 Ohms. The listening room is about 6000 cu. ft. with large openings into the adjacent family room and kitchen. Does this sound like a formula for success? Not likely. Emails flew and a plan was forged. Next thing I knew, the SRs arrived. The first thing you need to know about them is that you probably need help to unload them and get them into your home. They are heavy — 150 lbs. per side, a consequence of constrained layer damping rubber, inch thick MDF sides, 2-inch thick front baffles and MDF honeycomb internal bracing. If your habitat includes a loading dock, a freight elevator and a dolly you're in good shape. Each loudspeaker comes in its own box and the cardboard conceals plywood on the inside. Shipping weight is about 200 lbs. per side. The Chinese packaging is substantial and effective, but the VR-4SR Mk2, like all its more expensive siblings is built here in the USA. (Only the VR-4JR Mk2 is built in China to Von Schweikert's specifications under the watchful eye of their own Quality Control people). The velvet bags that surround each module add an elegant touch, but beware. The loudspeaker cabinet and the velvet make for a slippery combination. The mid-tweeter module almost got away from us as Linda and I lifted it up and out of the box. The bass unit was so heavy I rolled the box onto its side and slid the loudspeaker out onto the carpeted floor. From there on, it was relatively easy to set up. The owner's manual goes into great detail about set up, but I figured it would end up where both the JRs worked best and my reference Kharmas normally reside. The manual prescribes listening to white noise and moving the speakers to the point where the noise coagulates in a ball right between the loudspeakers. Bingo! There it was. I'm able to place the speakers on the long wall with unequal distances to the left and right of each speaker (10' and 16', respectively). This puts the side reflections (what little there are), far behind the sound waves coming directly from the loudspeakers. These loudspeakers have wide dispersion drivers and positioning them firing straight ahead rather than angled toward the listening chair provided exceptionally even tonal balance. If you are working with sidewalls in close proximity to the loudspeakers, you may find it helpful to angle them in for better imaging. It doesn't hurt to try. The arrangement makes for a very wide and cavernous soundscape when the spatial cues are present on the recording. The sunken floor of the immediate listening area and the vaulted ceiling also contribute nicely. A small jungle between the loudspeakers and the wall of windows behind them helps diffuse the back waves. Artwork and large bookcases full of LPs nicely diffuse and absorb reflections. I'm fortunate to have such a wonderful listening room. But I'm also keenly aware that the most important component of any listening system is a significant other who tolerates and appreciates such a commitment to music. I fired up the rig and checked the drivers to make sure they were all working. The right rear-firing tweeter was sounding a little static-y and anemic. In fact, the entire rig did not sound all that great. I let the rig warm up and read the manual. Ah-hah! Perhaps it was the high altitude sub-freezing air cargo trip from California and a multi-week layoff that induced the mediocrity. Or maybe it was my rig that had been idle for almost a month as late summer thunderstorms rolled over western New York. I let it play for several days without any listening time until life was interrupted by a week long visit from our daughter and three grandsons. With two babies and 8-year-old Izak (who climbs mountains with me in the Adirondacks) I was lucky enough to maintain access to my computer, but not listen to music. When life returned to normal adulthood I resumed listening. The most obvious feature was the absence of mid-bass boost that I found in both the JRs and my original sock-wrapped VR-4s back in the ‘90s. Strong, prominent bass had almost become a signature of the Von Schweikert loudspeakers. I liked this new approach. It was also evident that it is a very smooth, warm and detailed loudspeaker with very good transparency. With the front of the loudspeaker 63 inches in front of the windows, and the depth of them being about 25 inches, there was certainly the possibility of sliding them back toward the wall to reinforce the bass, had that been my pleasure. The manual also gives several tips about stuffing the port and the use of various cable types to strengthen or tighten the bass. Since the bass unit is a triple chambered transmission line ported on the front, positioning the loudspeaker closer to the wall would not have been a problem. The mid-tweeter module is a sealed enclosure. The trait that distracted me most in the initial listening was the more distant soundstage. The performers and musicians were further away than the presentation of my Kharmas, but not so far away as the razor sharp Escalante Design Pinyons. With the soundstage pushed back, the width of the stage remained the same, but because of the greater distance from the listening position, it occupied a narrower field of vision, just as if I had taken a seat further back in the theater. With the Kharmas, on some recordings the musicians seemed to be out in my peripheral vision. The more I listened, the less this bothered me and eventually it became a non-issue. At this point the loudspeaker was appealing very much to me. It was besting my reference Kharma 2.2c by a recognizable degree in almost every category. But it was still not living up to the hype that Albert had laid on me in a phone conversation and several emails. As I was listening to music and admiring the way the very attractive wood cabinetry looked against my jade and ficus jungle it suddenly dawned on me that I had not removed the grille cloth after the grandpups left! Well, that helps! But the point here is that it still sounds great even with the grills in place, as you might do when throwing a party. With the grills now off, I started to get more serious about listening as I waited for the Rocky Mountain Audio Fest to end and a couple of additional amplifiers to arrive. At reasonable listening levels the Mahis were doing an admirable job with sufficient power, but they were an unlikely candidate for a loudspeaker almost five times their price. The claimed 92dB/W/m sensitivity of the loudspeaker helped the Mahis out for sure, as they put out about 18 watts into the 4 Ohm bass unit and only 14 watts into the 8 ohm mid-tweeter. By the way, since the loudspeakers were shipped without either the computer grade bayonet type jumper, or jumpers for the conventional plastic covered binding posts, I bi-wired with two 8' sets of JPS Labs Super Conductor Plus, a combination that proved its merit in my review of the JRs. Albert refrained from making any specific brand recommendation for cables, but a sticker on the binding post plate indicates that he uses Analysis Plus wiring internally. As I learned in the JR review, bi-wiring was superior to using a jumper cable, and vastly superior to using the bayonet jumper, which should only be used as a last resort. In fact, I'm surprised he still includes the option, but perhaps that connection is more corrosion resistant in tropical markets. All in all, to this point, I was very impressed with the way the Mahis were driving the SR. They were certainly doing much better than with the original smaller JR, though the bass was not as tight as I prefer and it lacked the slam that is afforded by amplifiers with larger, more expensive transformers. I wondered, for example, how the SRs might perform in a room half this size with the KR VA340 I loved so much. Sound Dead Steel, you may recall from my earlier reviews, is the British company that makes an excellent turntable mat with a visco-elastic polymer sandwiched between dissimilar thicknesses of either aluminum or stainless steel. At my request they made up a set of 3" squares from this Sonphonon material. It yielded outstanding results when used as vibration absorbers between footers and the chassis of a component. They also worked wonders under the spikes of a loudspeaker. 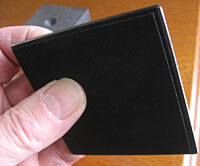 These squares literally transformed my Linn turntable. But SDS did not bring the squares to market. Sensing the opportunity and reading about the synergy I found with the squares and his Boston Audio TuneBlocks, Austin Jackson picked up the ball and ran with it. I followed up with a rave review of his TuneBlocks in the August 2007 issue. Not long after, Les Thompson of SDS dropped me an email telling me he was sending his new Isofeet squares and a revised turntable mat. The Isofeet squares arrived just before the Von Schweikerts. They were individually wrapped in neatly folded paper with Sound Dead Steel printed on it — a nice touch that suggested little expense had been diverted from the cost of the product toward the packaging. This also lowers the carbon footprint. Unwrapping the first square was an "Oh, wow!" experience. It was very nicely finished in the same mat black as the new turntable mat and the bottom side was neatly covered with neoprene foam that had a very sensuous feeling and would not likely slide on wood floors or various types of shelving. Les said they switched to air-dried paint since it doesn't stress the material with high temperatures like the baked on powder coat that was previously used. The neoprene foam on the Isofeet is the same foam that comes with the new Isoplatmat, and it is offered as a turntable mat in its own right. The neoprene is quite unlike the acoustic foam SDS uses in their industrial enclosures and recording studios to reduce airborne noise. Les tells me Sound Dead Steel has just been awarded the 2007 Rushlight environmental award for noise and vibration control, an honorable feather in their cap, for sure. If he could devise a material that would keep car audio systems from farting obnoxious bass notes I'd give him an environmental award, too. The new Isofeet were just what I needed to tweak the VR-4s between the upper and lower modules without risking damage to the tops of the bass units. And with the cache of squares Les sent along, plus the original SDS prototypes and Boston Audio TunePlates, I had enough to treat the speakers and leave the rest of the rig intact with virtually everything supported on these plates. It was an unexpected dream come true. The upper module of the VR-4 has 0.75-inch conical feet made of a hard rubber-like material that rest in the conical depressions of round metal inserts in the tops of the bass units. This system not only aligns the two units, but also provides an interlock that to a degree inhibits the upper unit from accidentally being pushed off the bass unit. While this is an elegant solution with an admirable nod to safety, I strongly suspected it compromised the audible results. I conjured up six hybrid footers, enough for three per loudspeaker. The bottom layer of all was the new SDS Isofeet squares with the rubber contacting the top surface of the bass module. On one set I used Boston Audio Mini TuneBlocks as the middle layer to add enough height to lift the feet of the mid/tweeter module off the surface of the bass module. On the other set I used Symposium Acoustics Couplers, which are perfectly machined brick shaped blocks of aircraft grade aluminum. And for the top layer of the sandwich I used a set of SDS prototype squares on one loudspeaker and a set of Boston Audio Designs TunePlates on the other. Under the spikes of each loudspeaker I used a Boston Audio TunePlate on my carpeted joisted floor. I've often wondered if this would be necessary if I had a concrete floor like many Southern and Western homes, but for obvious reasons, I'm not about to relocate the rig to my basement to check this out. I first used the TunePlates under just the bass units without treating the interface of the bass and mid/tweeter units. Predictably, the bass tightened up, but there was little, if any, improvement to the rest of the spectrum. Putting the SDS sandwiches under the mid/tweeter units proved the merit of my endeavor. The VR-4SR Mk2 went from being a very competitive $12K loudspeaker to being one worth twice that price. I was greatly impressed. My previous work with SDS and Boston Audio Design products led me to predict the outcome, but actually experiencing the results was extremely gratifying, as was the music itself. The sandwiches not only improved the focus of the midrange and treble, but also further tightened the bass by filtering out micro-vibrations coming from the mid/tweeter module. Chief among the benefits is more pinpoint localization of the musicians as well as improved micro-dynamics and inner detail. You've heard these words before; I know. I've talked with manufacturers, including Albert himself years ago, about improving the interface of loudspeaker modules. It is a tough sell. When I suggest that a few hundred dollars worth of Isofeet or TunePlates will turn this $12K loudspeaker into something worth over $20K, you should be getting an idea of the magnitude of improvement they bring, despite the rule of diminishing returns. I've used the SDS Isofeet squares and Boston Audio TunePlates pretty much interchangeably since an earlier comparison of the prototypes of both yielded virtually indistinguishable outstanding results. The finished SDS product, however, may be preferable in situations where there is concern about scratching a wood floor or the surface of a component below. My experience shows that having the metal surface directly in contact with the bottom of the chassis of a component or the cabinet of a loudspeaker yields the optimum results. Merely placing them under the existing feet of components is not nearly as beneficial. (Note: the VAC amplifier. which is built like a tank, benefited only a little from these plates. If your components are in this same build category you might not experience as much benefit, although the relative cost to check this out would be trivial). Perhaps the best solution for the VR-4 would be a 0.75-inch high super footer with a TunePlate on top of a 3-inch square of carbon graphite on top of SDS Isofeet, all bonded together. With nine square inches of surface contact per footer this should provide enough friction to keep the heavy mid/tweeter unit from sliding off the bass module. The rubber padding on the bottom of the Isofeet squares should keep the footers from sliding. Down at floor level, I prefer to use Isofeet beneath the spikes on my carpeted floor since under the intense pressure at the point; the loudspeaker does not easily slide around. The squares themselves crush the carpet under the weight of the loudspeaker and are thus anchored to the floor. If you have a wood or concrete floor, you might try removing the spikes and just using the plates beneath the loudspeaker cabinet. Let me know how this works for you. I don't mean to suggest that the Isofeet are not sufficient products in their current form. They are. Their thin nature allows them to be placed between existing footers and components with very little vertical displacement — about 3mm, plus the foam which compresses to virtually nothing under a heavy component. Spacers used to raise the Isofeet into contact with the bottom of components may impart a slightly different tonality to the music. I seemed to notice a slight more warmth or woodiness when using wood blocks rather than graphite or aluminum, which were neutral. A minimal approach to treating the SR would be four plates on the bottom of the mid-tweeter module held in place by wood blocks and four plates under the spikes. Three-inch squares of synthetic countertop material might be effective and very attractive. Try what you like, and trust your own ears. My primary concerns about reviewing the Mk2 had been my lack of suitable amplification and the amount of work involved. Well, by this point you can probably sense that work had turned into play, and the little Manley Mahis acquitted themselves quite nicely. But the plan had been for Albert to send me his personal VAC Phi Beta integrated amplifier. At $20K, obviously this is no ordinary integrated amplifier. Kevin Hayes, president of VAC, asked me if I would like a set of new tubes for it, knowing that Albert had rolled almost every tube with NOS vintage tubes. "Well...sure!" My front ends did not lay idle as I awaited the new tubes. With the VAC in place the music reached an all-time high for me with even greater focus, transparency and musicality. Most notable was timbre and texture of electronic music on Hearts of Space on NPR. The detail of electronically created music was astonishing, causing me to recall the time, years ago, when a young electronic musician brought a demo disc to my house to listen to it. He couldn't believe the rich tonal colorations he was hearing for the first time in the music he had created in a very humble recording studio. It seems kind of silly suggesting that notes of electronically generated New Age music have tonal qualities as subtle as those of conventional instruments, but with the premium amplifier in the rig the MK2 made it abundantly clear. Oh, and did I say the space was vast? 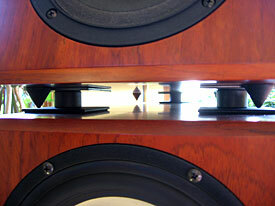 At first, I thought the width of the soundstage was not quite as wide as with my Mahi monoblocks. After all, that's why people have monoblocks, isn't it? To get a wider, more defined soundstage? But when I examined the geometry it became clear that with the soundstage a little more recessed with the Mk2 than with my Kharmas, it was still just as wide. This slight difference was soon assimilated by the multitude of improvements the VAC brought to the music. Adjusting the volume was like using a zoom lens on a movie camera. Everything remained in focus, but the musicians became larger and closer as the volume increased. The detail of musicians further back in the soundscape did not become obscured by those in front as the volume was raised. And of course all of this argued in favor of listening at volumes that are appropriate for the type of recording. Play Joni Mitchell's Blue louder than she would sound live and un-plugged and of course she will appear larger than life. You need Phil Spector's wall of sound — you got it, although with the absence of distortion coming from the Mk2s, the wall of sound is not as dense as you might have thought. And yes, it does classical music extremely well, too. The option is yours. You get to choose. When an audiophile friend came over we reconfigured the rig and I began using the VAC as an integrated amplifier, rather than just as a power amplifier. LP playback suffered a bit as I had to transfer my turntable from a wall mounted shelf to a floor-standing one so the phono cable would reach the inputs of the VAC on the low amp stand. I was forced to walk like a cat to keep the cartridge from groove hopping. In spite of this drawback the transparency of the sound took another convincing leap toward looking like air. Yet, in the back of my mind I kept wondering how much better it might be with the turntable back on the wall mount. The improvement in transparency brought about by the control section of the VAC manifested itself with LP, tuner and CD playback. The VR-4SR MK2 telegraphed every change to the rig. About this time the stock VAC tube set arrived and it too made a noticeable difference. By comparison, Albert's selection of NOS tubes sounded warmer, slightly rolled off at the top end, and more analog-like. The stock tubes contributed a little more focus, transparency and air at the top end with seemingly no roll-off at either end of the spectrum. This new tube set minimized the difference between CD and LP playback in my rig and I left it in place for the remainder of the review period. Here again, with tube selection, you get to choose. A lot of reviews are written as if the product was evaluated in a consistent, unchanging reference rig and some reviews acknowledge the ebb and flow of additional components during the review period. Ebb and flow is probably a lot more common than most reviewers reveal. Similarly, I lament the fact that a reviewer's system is not always specified, as this gives additional insight to the product under review. (At Enjoy the Music.com the reference systems of many writers, including myself, are listed in their bios). After a long absence of equipment to review that allowed me to get out in the woods and paddle in the Adirondacks this summer, products converged on me this fall. I had been longing for an opportunity to review PS Audio's Quintessence Power Conditioner with the new Super Filter. This break-through filter is supposed to reach further down into the audible spectrum than any other "conventional" conditioner. After a very long production delay and the subsequent pent-up demand, a review sample was finally turned loose on me. The actual product looks like the upper half of the Premier Power Plant regenerator, which is to say, a lot more serious and refined than the photos on their website reveal. (This is not uncommon with sleek contemporary designs whose studio photographs look more like digital art than actual photographs). A complete review of the Quintessence will be forthcoming, but I need to address its contribution to my assessment of the VR-4SR Mk2. The Quintessence allowed me to plug my entire system into my 30A JPS Labs In-Wall dedicated line with complete isolation between every component for the very first time. Normally I have my digital components on a generic dedicated line and the analog components on the JPS line. As suggested in the owner's manual, I inserted the PS Audio Soloist at the end of the JPS dedicated line and connected the Quintessence to it using a JPS Labs Power AC+ cable. This gave a preliminary cleansing to the current before it even reached the Quintessence, and seemed to add an improvement proportional to the cost of the Soloist. The improvement in transparency extended from the bass on up, but it was the refinement in the resolution of the treble that was most easily identified. Adding the Quintessence did not shift the tonal balance, but the shimmer of cymbals, the upper harmonics and upper end air of the system clearly benefited the most. At the lower end, ambient room tone became more discernable, especially in live orchestral recordings, as you would expect. It has been a wonderful convergence of improved amplification, vibration absorption and purification of electricity that brought the system to an all-time peak for me. The VR-4SR Mk2 revealed every step of improvement along the way, suggesting that this peak was merely another false one, awaiting improvements to my various front ends. How much farther could I go with a better cartridge, or a better turntable? And how about a better transport and DAC? No doubt, the VR-4 would tell me. The visual design of the VR-4SR Mk2 is exceedingly easy to live with. In the African Hazelwood finish of my review samples it works very well in contemporary, transitional and traditional settings and it is one of the few loudspeakers out there that fit in with country cherry or the maple finishes of vintage colonial furnishings. The wood veneer fit perfectly with the small jungle of ficus, jade and cacti that separate the listening triangle from the front wall of windows. The only other finish available is the Piano Black high gloss polyester resin paint, which can either be seen as very contemporary or very traditional in a tuxedo kind of way. With either take, the Piano Black is a very universal color that will either blend with what you already have or become the counterpoint to it. As a visual counterpoint, it has a strong presence. When I took on the Kharmas as my reference some years ago the Piano Black was the aspect I love the least. But now, it has grown on me to the point where if I could choose between the African Hazelwood and Piano Black, I would probably flip a coin. The problem is that tree species only find their way onto the CITES list after their populations have been decimated, and many, many valuable tropical tree species are being over-harvested -- often illegally -- in their range. Estimates of rates of illegal logging in Indonesia by Greenpeace and others are as high as 75% of timber production. I don't know the specific figures for Madagascar, but they can't be good. The bottom line is that if you want to be sure that a tropical species isn't illegally mined from the rainforest, then you need to demand the FSC label. Legitimate, independent forest certification is lagging in the tropics because there is so little real management of tropical forests, the regulating agencies are mostly corrupted, and the low costs of illegal wood undercut legitimate activity. Only a huge and sustained demand signal for "good wood" from the developed world, coupled with a major international crack-down on illegal timber, has a hope of bringing the "wild-west" situation that prevails in the tropics (and also parts of Siberia and Eastern Europe) under control. When that happens, perhaps substantial tracts of those forests can be brought under sustainable management and green-labeled tropical species will be easier to find. Good luck, and thanks for caring. Von Schweikert is to be commended for moving away from these exotic veneers. As much as I admire the beauty of rare and exotic wood species, there is much to be said for avoiding them. In my own industry, there is growing momentum for using plentiful woods from sustainable forests for furniture. There is a groundswell of interest in "green" products in many other segments of our culture as well. Just as we've learned to keep warm without exotic fur coats, we can enjoy the music without exotic veneers on our loudspeakers. If you wish to draw visual attention to your listening room, it is easy to do with paint, area rugs, unique listening chairs and artwork. For that matter, the piano black would make a wonderful canvas. Have you hugged your local artist, lately? If you need some inspiration, check out my Decorating for Music articles on this site, or visit your custom motorcycle shop to get an idea of what is possible. 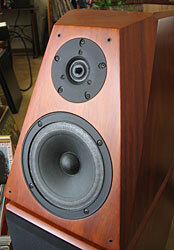 What the VR-4 Series does not do is forget that it is a loudspeaker. Its shape and form reveal its purpose whether you leave the grilles on or take them off. Normally, I abhor naked drivers that leap out of the cabinet and grab your attention. Black recedes and either blends with or complements most finish, so the unusual looking silk dome tweeter and new midrange driver were quite acceptable. The 8.5-inch aluminum woofers have satin titanium colored finish that caught my eye in daylight. But they took on a rich subdued patina that was quite appealing when listening under a just the small spotlight I use for reading at night. In daylight listening sessions I eventually came to ignore them, which is as it should be. From a size standpoint, a comparison with the JRs shows them to be 5.5 taller, 3 wider and only 4 (inches) deeper. In living with them both, albeit more than two years apart, the frontal view seemed about the same, but I would have guessed the SR was a lot deeper than the JR. At least that's the way they appeared when I entered the room and viewed them from the side. From a construction standpoint, the bass module of the SR has been beefed up to the point that it neither requires nor permits the addition of lead shot to dampen the bass. This is a good thing for the owner and the environment. To dampen the bass, more fill can be added via the front reflex port, but as I said, the tonal balance of the loudspeaker felt just right. I also noticed that the finish on the black trim strip at floor level seemed to have been improved from the earlier JR model. At the RMAF my friend Tom noticed Von Schweikert using a wide ribbon-like cable, ala Nordost, in his room. Albert confessed that he is working on a speaker cable an offered to send me a set. After many weeks, the box arrived. What it contained was not a ribbon style cable, but one that was rather conventional, except for the four 27-inch speaker leads that allow for bi-wiring with a single cable. Spades on the amplifier end, bananas on the other, both of very high quality. The cable was very flexible and not terribly thick, varying between 5/8 and 0.75 inchs depending on the twist of the leads within. It draped nicely behind the loudspeaker drawing much less attention than bi-wiring with two pair of cables. Since the mid/tweeter module inputs are about 32" off the floor, the 10-foot speaker cable is functionally equivalent to an 8-foot length. But the physical appearance did not compute with the enclosed invoice for $2500. There were no magic boxes or battery packs attached to the cable. (Maybe I should go cable shopping more often)? Immediately I suspected the metallurgy and the physical form of the conductors. Right out of the box, there was an instantly recognizable increase in transparency across the spectrum in a system that was already the most transparent I've ever had at home. No changes to the attack or decay; no syrupy glaze to the music. There is simply a greater sense of ‘being there'. By the next day with more play time, the music was stunning. Then, to make matters even worse, Albert informed me these were the "Standard" model, and a "Signature" model and interconnects would follow. Coming from a humble home-brew cable background, I never thought I would ever suggest that $2500 for a 10' pair of speaker cables was a wise investment. They are not as great a value as the SDS Isofeet, but they certainly make magic with the VR-4SR Mk2. It is time to draw a line in the sand and pinpoint some specific characteristics that were revealed by particular pieces of music. Mickey Hart's Planet Drum revealed the tightness of the Mk2's bass, both with the VAC and my Plinius SA-100 Mk III. It also pointed out that there was only a small difference between the tube and solid-state amplification, lending support for the Von Schweikert suggestion to try bi-amplification with solid state on the bass and tubes on top. The bass was as musical as bass notes get, and there was no apparent mid-bass hump with this music. The XRCD24 re-mastered Sheffield Lab Drum and Track Disc on the Lim label was noteworthy not only for the dynamics that the drum improvisations reveal, but for the smooth analog-like sound reproduction. John Marks kindly sent me a copy of Pipes Rhode Island, a compilation of organ music he had a very significant hand in creating. He pointed me to cut 10, Howell's "Master Tallis's Testament," a piece I'm sure you're all familiar with. It gets down to 20Hz, possibly lower and the note has as much definition as middle C, yet is neither underwhelming nor overbearing. Early on in the review process this cut revealed what I though was an excessive amount tape noise, suggesting that it was indeed a "basement tape" — as if that was where it had been stored for the past 20 years. In a forgiving manner, John informed me that it was recorded with a Sound Devices hard disc recorder back in February 2007. Sure enough, when I revisited the cut after the system had become more refined, I could clearly discern the high pressure air of the huge organ's air supply system venting through the bypass during the softer passages. It is a wonderful recording, putting you right in St. Stephens Church in Providence. Buddy Guy's cover of "Mustang Sally"from his acclaimed album Damn Right, I've Got the Blues conveyed the nuance of his guitar style and reminded me why people in his live audiences scream for him to play that song. He blows away the original. The pace and rhythm made me want to get up and dance. In "Rememberin' Stevie", the instrumental ode to Stevie Ray Vaughan at the end of the disc, the holographic soundstage revealed the great depth the Mk2 is capable of recreating. Joan Osborn's cover of Dylan's "Man in the Long Black Coat" in her mega-hit relish revealed the tension of the lyrics. Emotions in the music have nowhere to hide when the system upstream of the Mk2 is equal to the task. Likewise, when hell breaks lose with music and song such as "Spider Man," the Mk2 stays right with it and keeps it all intelligible. Jackie Wilson took me back to 1958 with "Lonely Teardrops," but it sounded way better than any music did back in 1958. I felt like I was in the recording studio reviewing the master tape. Soft female voices can leave me struggling for recognition of unfamiliar lyrics. Norah Jones' Come Away With Me is a good example. And here, the Mk2 did not let me down, delivering almost every word on the first pass. Bravo! Neil Young's live performance of "Natural Beauty" from Harvest Moon conveys the emotional & cultural roller coaster ride of which he sings, and the Mk2s capture the live event and reveal the studio overdubs. Really spacious! The way this loudspeaker evokes real emotions, not just goose bumps, is uncanny. The Mahavishnu Orchestra's The Lost Trident Sessions, recorded in 1973, but resurrected in 1999 and digitally re-mastered in 20-bit digital form, shows how the Mk2 can take the "confusion" out of classic fusion. This album really showcased the incredible speed of the Mk2's drivers. Ditto for Santana's Supernatural — especially the "The Calling" in which he shares the stage with Eric Clapton, and "Put Your Lights On" with Everlast. Joni Mitchell's Blue first brought to my attention the Mk2s ability to reproduce height. My ears fall slightly below the center of midrange (and even further below the tweeter). Perhaps the vaulted ceiling had something to do with it, too. Once I noticed this sense of height, everything thereafter seemed vertically unrestricted — especially live recordings like "Natural Beauty" mentioned above. John Marks' 20-bit recordings on Music for a Glass Bead Game were another set that seemed especially analog-like thru the Mk2. The transparency of these recordings of string instruments showed off the superb tweeter that took the harmonics far higher than I can cognitively recognize. Yet there was no denying the openness and sense of fresh air up there. The tip-off was the fluidity and the absence of irritation. You could hear the edge of the notes, but they didn't cut off your ear. (This was truer when the Mk2 was powered by the VAC rather than the solid state Plinius, although the Plinius sounded considerably better through the Mk2s than I anticipated). Hugh Masekela's "Stimela" revealed the dynamic contrast capabilities of the Mk2 as the "coal train" pulled into the station and when his trumpet cut through the live venue. The choir in Lyle Lovett's "Church" revealed the outstanding clarity at the back of the soundstage, as did Bruce Springsteen's overdubbed refrain "57 channels and there's nothin' on" in the song "57 Channels". This was the clearest I've ever heard the refrain. The soundstage itself is slightly recessed, but the depth of the soundstage goes way back, virtually to analog dimensions. Paul Simon's "Diamonds on the Souls of Her Shoes" and Bob Seeger's live version of "Turn the Page" are conspicuous for their lack of transparency in comparison with the other recordings on my compilation disc. But with the Mk2 and all the other goodies now in my rig, the difference was greatly diminished. The fourth movement of Mahler's 1st Symphony with Leonard Bernstein conducting the New York Philharmonic embodied most of what I think of when I think of classical music. It came across with force and finesse, allowing me to experience both the whole orchestra and zoom in on individual sections. The vastness of the venue was convincingly recreated. The list goes on and on without the Mk2 ever stumbling. The only quirk I noticed was in the rear-firing ambience tweeter. It did not seem to have the range of volume adjustment of the earlier VR-4 models I've used. Nonetheless, the goal of holographic sonic imagery with outstanding clarity was certainly achieved and the depth of soundstage was as manifest as Albert suggested it would be. While the listening chair was the best seat in the house, even sitting off axis when friends came to visit provided very enjoyable listening. Like Dave Wilson with the Watt series, Bobby Palkovic with the VSM Merlin, Israel Blume with the Coincidents, Richard Vandersteen with his whole line, and some other less visible designers who escape me at the moment, Albert Von Schweikert has a design philosophy which reviewers have repeated endlessly and you can read on his website. And like these others, he has continually refined driver and crossover technology and improved cabinet integrity to maximize the design concept over many years. All these men sweat the details. Albert talked about the oversized crossover coils and driver magnets he used to prevent distortion at high volume. They do LOUD very well. (I spent some time at 105dB at the listening chair without feeling like I was punishing myself). And he spoke of the crossover as the "heart" of the speaker system with extremely expensive German Mundorf capacitors and Analysis Plus internal wire made here in the USA. He raved about the aluminum coned Excel woofers from Norway as being second only to the Excel magnesium ones in the $25K/pair VR-5SE, and indeed it is a very deep and musical bass. He praised the speed and detail of the Audax Aerogel midrange driver from France with a composite cone made of carbon fiber powder, Kevlar threads and cellulose acetate pulp. The Vifa dual ring silk tweeter from Denmark contains no metal, diamond, ceramic or other harsh additives. It sings all the way to 40kHz, he claims. I can't hear that high, but there was no denying the sweetness of string instruments and the seemingly unlimited air at the top end. Do I repeat myself? Moreover, these are all highly customized drivers made to Von Schweikert's specs so they will integrate at the designed crossover points. Likewise, even the inductors in the crossover are wound to specific values required by the specific drivers he uses. Nothing is "off the shelf" here. And the results? As someone sang, the sweat pours out like honey. Perhaps even more important, where most successful businesses have a board of directors, Albert has a review group of peers who listen to his new creations and give him feedback on how they compare with the competition he has targeted. In the case of the VR-4SR Mk2, the final targets were the$28,000 Wilson Watt Puppy and the $34,000 Avalon Eidelon Diamond. I've only heard these loudspeakers at shows where the rooms were less than optimal and the supporting systems far outstripped the cost of the rig that has come together for this review. But like a rock in a sling, the listening room and how a system is tweaked can be powerful equalizers. From what I've heard, it would not surprise me if a lot of people considering the targets mentioned above pocket the difference and come away with Mk2s. And many who are considering lesser loudspeakers may very well dig deeper into their pockets once they've heard the Mk2s. They're that good, if not even better. The two-box format obviously has certain limits, which opens the door to a series of loudspeakers above the VR-4 group at substantially higher prices with evolving cabinet designs and driver complements. The entire line now remains true to his design philosophy with its proprietary Ambience Retrieval System™ and Global Axis Integration Network™. With the discontinuation of the VR-1, VR-2 and home theater loudspeakers, the VR-4JR MK2 and SR MK2 now anchor the bottom of the line. While this leaves the company in some pretty heady territory, I expect this decision maximizes Albert's energy and the expertise of the entire Von Schweikert team. The Mk2 has taken a 50 percent jump in price over the previous version that sold for $8000. For those with the original SR an upgrade is available at the factory for $1490 plus shipping both ways which would probably put total cost in the $2000-$2500 range. Not having heard the SR version since the New York show in 2005 where it was shown in a small room, it is difficult to estimate how worthwhile the upgrade would be. If you own the SR now and have the opportunity to audition the MK2, I emphatically recommend doing so. And the closer you live to Temecula, CA, the easier your decision may be. You should most certainly take advantage of the benefits of the SDS Isofeet whether you decide to keep your SR as-is, or upgrade to Mk2 specs. I find it helpful to revert back to the original system to verify my findings. Because so many variables were changed in the rig, I backtracked in stages. First I removed the Isofeet from between the upper and lower modules. There was an immediately apparent loss of focus, but the transparency remained pretty much intact. Then, I swapped out the Mk2s for my reference Kharmas. While the efficiency of the Mk2 is listed at 92dB/W/m and the Kharma at 89dB/W/m, there was a noticeable increase in volume when I re-installed the Kharmas. They came across as being sharper and more aggressive than the Mk2s. I realized that the soundstage of the Kharmas was not more forward than the Mk2s, but rather it was the distortion on the edges of the notes, the harder sound that made it seem like the musicians were closer. In contrast the Mk2s had a much smoother overall presentation and the bass was noticeably deeper. The bass of the Kharmas, however, is often under rated. It is quite tight and goes down deeper than most people probably realize, but not into the very deep bass as does the Mk2. Where they were positioned, neither loudspeaker exhibited a mid-bass hump that is so highly prized by head bangers. Alternate placement can change that if you wish. 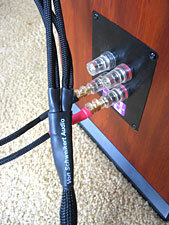 Next, I swapped out the Von Schweikert speaker cables for the JPS Labs Super Conductor+. This took much of the edge off the Kharmas and made them easier to like by softening the image slightly. This is just the opposite of the effect the Von Schweikert cables had on the Mk2s where it tightened the focus and sharpened the edges to bring the music closer to the ultimate quality of the recording. There was also a small loss of transparency in reverting to the JPS Labs cables, though to be fair, they were much less expensive than the Von Schweikerts, and certainly made the music with the Kharmas more listenable. At this point, it became obvious that much of the increase in transparency I experienced with the Mk2s was due to the cables and the VAC amplifier. This tells me that the Mk2s are extremely qualified to pass on whatever signal they are given and deserve to be preceded by very fine components. How fine, you ask? Probably the best you can afford with out being foolish or jeopardizing your net worth. Given the amount of work required to switch back to the Manley Mahis and my CAT preamplifier, I didn't backtrack that far. Nor did I go to the trouble of making an in-room frequency response chart. The tonal balance was extremely smooth to my ear and I didn't hear anything I wanted to change, though other folks may have a larger appetite for bass. I could feel the bass in my chest at the appropriate times, but it didn't pin me to my chair. It wasn't until the final combination of products came together that the Mk2 became as fast and coherent as electrostatics, as Albert claimed. That is quite an achievement. True, my front end could use some upgrading, but I think I've pointed you in the right direction here. Be clear; this is a Real World loudspeaker that is capable of world-class performance in medium to moderately large rooms. To reach that goal, you will need to surround it with very fine components connected with high quality cables. Tweak your system and tune your room and you will be handsomely rewarded. The Sound Dead Steel Isofeet will be very helpful in this regard. In small to medium size rooms the newer version of the JRs with the right amplification might do you very well. They've risen in price to $5695 and are on backorder as I write this in mid December 2007. If you wish to step up a notch or two consider the new Anniversary JR at $6000/pr. in African Hazelwood or the Signature version in Steinway High-gloss black with Mundorf capacitors at $7500/pair. Successful manufacturers have a knack for properly pricing their products. Overpriced or under-selling products have a way of falling by the wayside as the technology evolves. Albert Von Schweikert and his staff are clearly among the very elite manufacturers of our time. It came as no surprise that the VR-4SR Mk2 was as good as it was. What surprised me was how good it became with the addition of the modest Sound Dead Steel Isofeet and the new Von Schweikert speaker cable. Not only is it as good, if not better than other American made loudspeakers at much higher prices, given the weak United States dollar, it trumps most everything in its league from abroad. In this upper echelon, the VR-4SR Mk2 loudspeakers have outstanding value. If you are on the verge of purchasing a new loudspeaker, this could easily be the one, which is to say it has my highest recommendation. If you can't find them locally, book a flight and go have a listen. Type: Dynamic-driver four-way system using a triple-chambered transmission line and two-piece stacking enclosure system to eliminate resonance and ensure image focus. Driver Complement: Two 8.5-inch aluminum woofers from Norway, one 7-inch carbon Kevlar-cellulose Aerogel midrange driver from France, One 1.5-inch silk dual concentric ring tweeter from Denmark, and one 1-inch rear firing ambience mid/tweeter with fabric dome and transmission-line loading. All drivers use proprietary Advanced Motor System with low distortion design. Crossover: Acoustic fourth order, at 190 Hz and 1.9 kHz, optimized for flat off-axis response and phase consistency over a wide Global Axis. Parts are sourced from Hovland, Solen and others, internal wiring is by Analysis Plus. Woofer Tuning: Triple-chambered transmission line hybrid design composed of three separate chambers and tuned vent at 23Hz. Cabinet And Bracing: A 2-inch thick front baffle and one-inch MDF fiberboard interlocking braces. Internal damping consists of thick acoustic felt and foam lining with Dacron stuffing. Large carpet spikes are provided. Binding Posts: Double sets of five-way rhodium posts enabling bi-wiring. Single wire can be used with optional Data Link connector. Dimensions: Midrange/Tweeter is 14 x 11 x 24) and Woofer is 29 x 11 x 24. Overall system measures 44 x 11 x 24 (HxWxD). Weight: Woofer module: 97 lbs., M/T module: 53 lbs. Warranty: Ten years Parts and Labor, excluding burned voice coils due to amp clipping. Warranty is transferable to second owner. Finishes: Available in four book-matched wood veneers that include African Hazelwood and Dark Red Cherry. Sycamore and Ebony wood are also available as premium finish options. A satin-gloss polyester resin clear-coat protects the fine wood surfaces. 1040 - A Northgate St.
Isofeet costs are £15:32uk (no vat) per set of 4, postage is charged at actual cost, perhaps £8 or £9 per set of 4. (I've left the price in £ due to the fluctuation of the United States dollar).